Countess Caroline de Saint-Cricq has been described as nothing short of an angel come down to earth, without worldly desires of whatsoever kind. Besides, she was very beautiful and very rich. Liszt became her piano teacher in spring 1828. While talking exclusively of holy things, they quickly fell in love. Supported by Caroline’s mother they wanted to marry. Shortly afterwards, on June 30 or July 1, 1828, the mother died. Despite a promise to his wife on her death bed, Caroline’s father, French Minister of Commerce Pierre de Saint-Cricq, then acted as antagonist, showing Liszt the door. Caroline fell ill and Liszt suffered a nervous breakdown. In 1830, by her father’s arrangement, Caroline married one Bertrand d’Artigaux in Pau in southern France, where she led an unhappy married life. Until this day not a single author has given detailed sources supporting this information. While researching documents that were written close to the time of young Liszt’s idyll with Caroline, it became clear to me that the oldest documents are mostly of an idealized romantic nature and contain significant omissions with respect to listing of sources. Many later biographies have blindly copied these stories. By the analysis and cross-referencing of many 19th century documents as well as on-site verification I’m pleased to present new insights on this key love affair in Liszt’s life. The catalyst for gaining this new understanding is Liszt’s piano composition named Faribolo Pastour. Liszt wrote it during a concert trip to Southern Europe in 1844. At a concert series in Pau in October that year, Liszt was reunited with his childhood love Caroline Dartigaux (née Saint-Cricq). During his two week stay at Pau, Liszt created two compositions which he dedicated to Caroline. The works are rarely performed. “Chanson du Bearn”, with caption title “Pastorale du Bearn” (S.236/2). Up to now, the title Faribolo Pastour has been interpreted using the French language, where it means Pastoral Whimsy. However, the poet Jasmin who created the song did not write in French but in a local patois: the Languedocien d’Agen. In this language, the word faribolo is etymologically translated as frivole (frivolous), with fariboulejes meaning flirtatious, fluttering about — like a butterfly. Rather than pastoral, the correct translation of the word pastouro from the Languedocien d’Agen is bergère (shepherd girl). This seemingly minor language difference changes the song from Pastoral Whimsy to Frivolous Shepherd Girl. This offers an exciting new perspective on Caroline de Saint-Cricq. Why did Liszt dedicate a song about a frivolous girl to his first major love Caroline who has always been described as virtuous and angelic? In 1875, Liszt stated to his biographer Lina Ramann: “These two little transcriptions are hardly known, and I have entirely forgotten them”. This is a bold statement if we consider that he dedicated them to the girl that, according to all of his biographers, was one of the most important loves of his life and key to his further development as a human being and composer. This website covers Liszt’s love affair with Caroline de Saint-Cricq, offers many new details on her background and family, describes Liszt’s acquaintance with the poet Jasmin and his works, outlines his concert tour in 1844 when he met Caroline again, and analyses Liszt’s and Caroline’s relationship in later life. Rather than continuing the romantic tradition I aim to sketch a realistic perspective on this relationship by matching evidence from new and existing sources. In the last section I have speculatively combined this information to create a pragmatic profile of Liszt’s idyll with Caroline de Saint-Cricq. I did not have anything else but the recording and a vague story about an impossible love affair. It took many more years before the composition was recorded by Leslie Howard. I bought the CD and a copy of the sheet music and was intrigued by the reference to a poet named “Jasmin” on the cover page. Despite several library searches, I couldn’t find any details about the person “Jasmin” nor his poem “Franconnette” on which Liszt’s composition had been based. They seemed to have vanished off the face of the earth. In 2007, during a late night stroll on the internet, I found an etymological dictionary from the early 19th century. It had been scanned only few months earlier by Google. It contained the words Faribolo and Pastour and, to my surprise, these words had a completely different meaning than mentioned in various Liszt biographies. A thrilling discovery! Some more nights later it was clear to me that, for unclear reasons, no one had ever seriously investigated this song nor Liszt’s romance with Caroline de Saint-Cricq. Many biographers had written romantic articles about this love affair (primarily copying each other) but no one ever provided details about who this Caroline was, where and when she was born, what her parents and siblings looked like, and what happened to her after the romance with Liszt. I decided to spend six months of a sabbatical leave to get to the bottom of this affair and, ideally, find out more about this mystery girl Caroline. Assisted by fast internet access to multiple global libraries with many digitized books, newspapers, publications and other historic data it took some four months, late 2010, to unravel the plot of Liszt’s romance. It took several more months to verify my newfound data with local libraries in France, meet with people that had knowledge on Liszt’s life and to visit the locations that were key to the story. I did not envision the small wave of excitement that was caused by my findings and the many follow-up activities that resulted from it, and I was able to extended my sabbatical leave to support these. 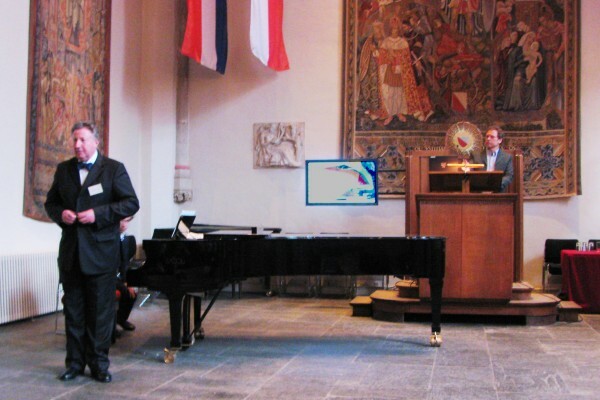 A scientific article by me on this topic was presented on the International Liszt Symposium in April 2011 in Utrecht, with renowned Liszt interpreter and expert Leslie Howard kindly performing the Liszt and Jasmin compositions. The article was published by the British Liszt Society in their Bicentenary edition of the Liszt Society Journal in October 2011. More details about Liszt’s Social ‘Facebook’ Network and his many female admirers was presented by me during a two-hour radio program for Belgian public radio in September 2011. I was honored to support the creation of a music program linking Liszt compositions with French poetry for two Liszt festivals in Italy late 2011. This website contains the information of the publication as well as many additional facts discovered during my research. It also allows me to write down many anecdotes and observations gained during the sabbatical leave with more images. It has been tremendous fun doing this study! There are far more items that can be researched, such as details of Liszt’s trip to Spain and his habit of converting folk melodies encountered during his travels into new compositions. I will be pleased to receive your comments and contributions to SaintCricqMail. In addition to the research of Liszt’s romance I will update this site regularly with other Liszt information and plan to add a list of all documents that I have collected (in paper copy and in downloadable digital format) during this research. If you are looking for any of the references mentioned on this website don’t hesitate to contact me via above mail. [↑] Leslie Howard recorded Faribolo Pastour on “Album d’un voyageur”, Volume 20 of his Liszt Complete Music for Solo Piano recordings, London, Hyperion, 1992. 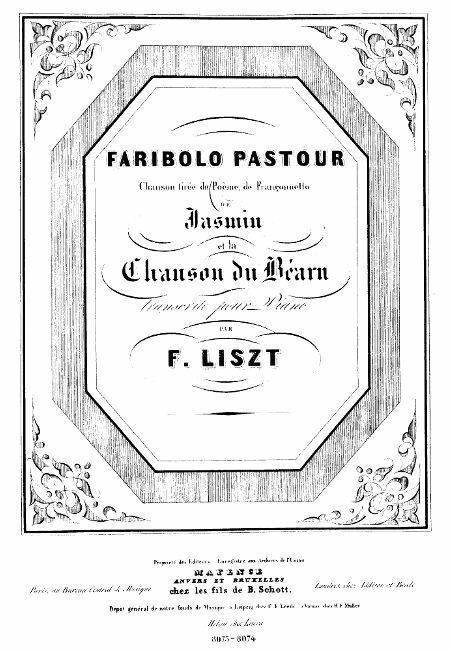 The music score can be found on-line at: imslp.org/wiki/Faribolo_Pasteur,_S.236/1_(Liszt,_Franz). [↑] Louis Boucoiran, Dictionnaire analogique et étymologique des idiomes méridionaux qui sont parles depuis Nice jusq’’a Bayonne, Paris, Welter, 1874, nouv. ed. 1898, p. 639, p. 1015 (vs p. 1016). [↑] Lina Ramann, Lisztiana, Erinnerungen an Franz Liszt (1873–1886/87), Mainz, ed. Seidl, rev. Schnapp, Schott,1983. p. 404. Jean Chantavoine, Les Maîtres de la Musique: Liszt, Paris, Alcan, 1900. [↑] Gert Nieveld, Caroline de Saint-Cricq: Siren with a heart of ice, The Liszt Society Journal, Bicentenary Edition, Volume 31, 2011, ISSN 0141-0792.